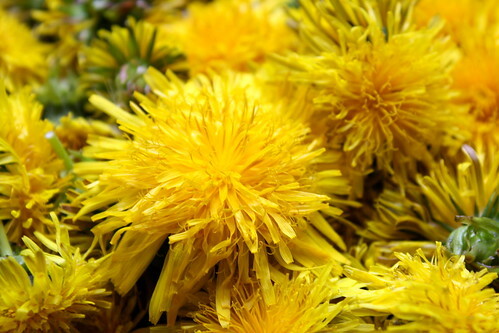 Until a few days ago, I’d heard of dandelion salads and wines, but never dandelion jelly. The idea intrigued me so much, I set about making it today. As we don’t spray for dandelions (or anything else, for that matter,) I had, shall we say, an “ample” supply of blossoms. Since many trees and flowering plants are blooming currently, I figured the bees wouldn’t mind me stealing a bit of their supply this afternoon. When the previous owners installed the new drain field in the yard, they didn’t cover the backfill with topsoil. 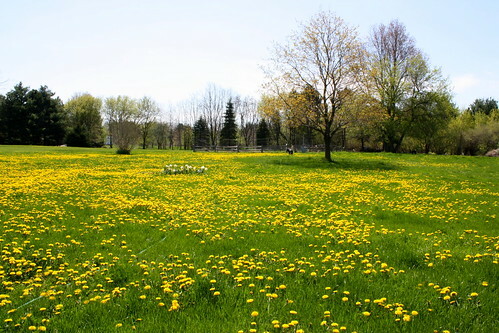 This has resulted in terrible growing conditions for grass, but outstanding dandelion coverage. As I’ve said before, I love dandelions. They’re pretty, they supply food for our insect friends and they’re edible. What more could a girl want? As I collected my bounty, I was reminded a little of berry-picking adventures when I was a child; casting about for the perfect quarry, not having to move too far to find it. Given the bountiful supply of bright yellow flowers, I could be somewhat particular about my choices. I picked the fullest, freshest blooms, shaking off whatever insects I could see. A side note for those of you squeamish about Insects in the House: This may not quite be the recipe for you. Despite being rather careful about getting the bugs off… there are still a metric honkload of new bugs in the house, everything from ants to gnats to small, unidentifiable beetles. I was especially careful not to get them into the measuring cup of trimmed petals – an ant preserved in amber is lovely. An ant preserved in jelly? Maybe not so much. It took me perhaps twenty minutes to gather up a full colander of flowers. I couldn’t remember exactly how much the recipe called for, other than “a lot.” I gathered way more than I needed. The remainder went to the chickens. They were far more interested in what bugs there might have been, than in the flowers themselves. Because I habitually rinse off food like the proverbial raccoon, I stuck the flowers under the running tap without thinking. Turns out that was a really dumb idea. It made everything soggy and damp and less fluffy. Trust me, “fluffy” is a desirable trait for the following step. Next up – trimming the petals away from the bud. Using my trusty Wuesthof kitchen shears (the one kitchen tool I could barely do without,) I cut the petals away, shooing bugs off as I went. It’s a bit of a finicky process, and took maybe a half hour to get the requisite two cups of petals. Since the petals will be steeped and strained, and since the bracts are edible, I opted to leave the ones that snuck in. I ran out of steam before I could finish and shelved it for another day. At this point, I should warn you – I polished off a bottle of wine as I was writing this next bit. Please forgive any … strangeness or worse-than-usual incoherence. Yes, I am drinking red wine out of a quart Ball jar. I am totally classy! Or at least, “voila” in theory. It’s been an hour, and mine hasn’t yet set up. I’m thinking the no-cook pectin is to blame. 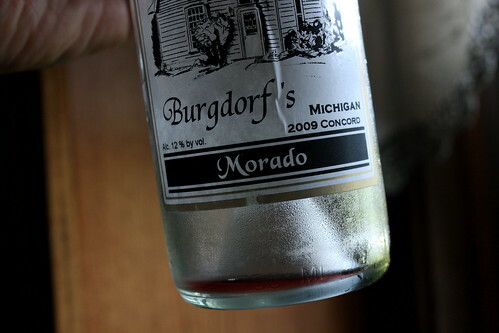 Or, perhaps it’s the wonderful Morado wine I’ve been drinking like grape juice. It tastes *just* like grape juice for grown-ups! Apart from my pectin-fail, I do recommend trying this. Because it’s low-cost, delicious, and pretty stinking neat. ‘Nuff said, right? PS – Over two hours later, no setting. It’s still liquid. Tomorrow, I’ll try the Extra Pectin Thing. 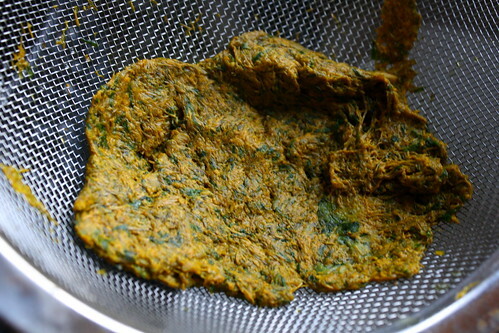 PPS – It never set up, and I never added more pectin. I’m content to have it be a yummy syrup. Next time, I’ll try different pectin. Or … something. Syrup instead of jelly, eh? I’ve had that happen from time to time. Thank you for this! 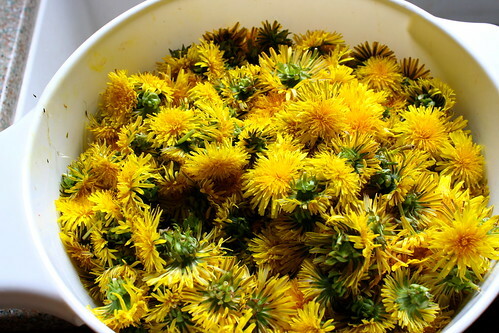 I adore dandelions as well — they are my favorite weed ever. So tasty and nutritious, and SO beautiful when they bloom. Thanks for teaching me another trick with them! Robbie, any clue what causes that? Glad I’m not the only one! 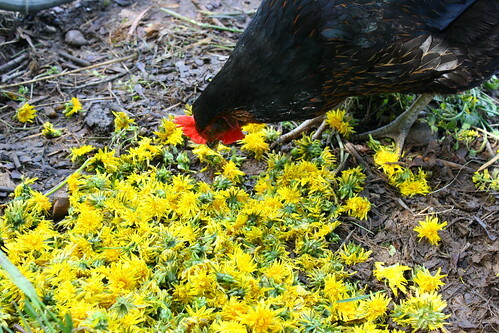 The great thing about dandelions is that they’re FREE~so it doesn’t hurt as bad if things don’t turn out as planned…although, dandelion syrup still sounds like a success! We’ve got a gallon of dandelion wine still fermenting…problem is that it’ll be a good 6 months or more before we can enjoy it! You should end up with about 3 cups of juice after straining. (I find one of those mesh gold coffee strainers to be great for this kind of fine straining – filters out any left over thrips and other tiny tiny insects). And it DOES taste like honey. 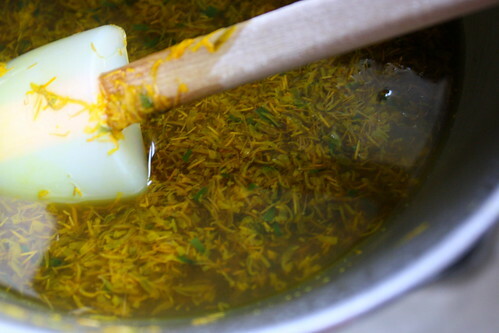 I always mix the powdered pectin with about 1/4 cup of sugar before adding it to the liquid, so it doesn’t clump up. Ask me how I know. Basically follow the general directions for use of any powdered pectin. Good luck. Now THIS is cool! Our dandelions are just starting to pop up, and I’ve never tried this! But I think I just might this year. Hubby might think it’s a little weird, but I’m sure he’ll get used to it. 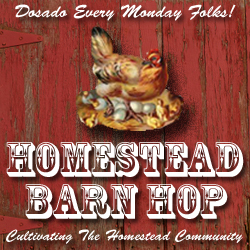 Thanks for sharing this with the Barn Hop this week! I’m bookmarking it! 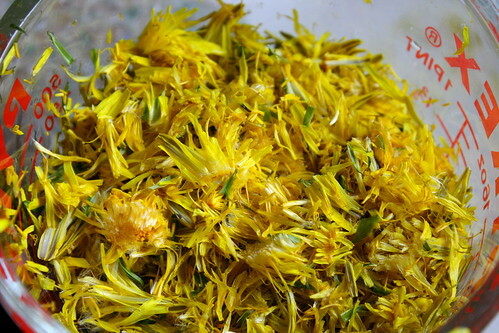 Great post, and the syrup is fab but if you want to have it set up so its thick, just keep simmering it with the sugar and it will thicken till about the same as honey, its what I call my mock Dandelion honey, but I just did a post on how to make real dandelion honey as well. I put up my post without checking the rest, so when I looked and say your post, I read and had a chuckle, looks like you did the syrup and I did the honey, its amazing just how good that that taste is! dr momi, that is a freaking FANTASTIC idea! oh my… i think i know what i’m making for later! Jill – once he gets a taste for how amazingly yummy it is, I bet he’ll be completely on board. 🙂 The lemon adds a wonderful quality, it’s really just delicious. 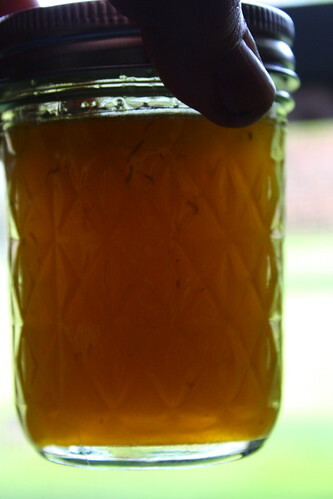 farmgal – oooo, dandelion honey! brilliant! I made dandelion jelly successfully for the first time this year. My first batch came out like yours, even when I added extra pectin. 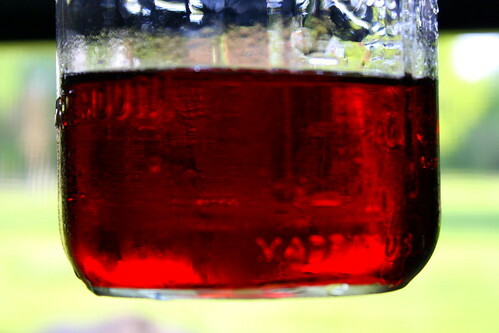 My second batch was PERFECT – and at risk of sounding like a commercial, my secret was Pomona’s Universal Pectin. It’s made from citrus peel and is activated by calcium (it comes with powdered calcium you mix with water). SO – it doesn’t need a ton of sugar to set up, and you can use about half the sugar or other sweeteners like honey to make your jam/jelly. I’ll never go back to regular powdered pectin again.